Kurt Wüthrich, a biophysicist at the Swiss Federal Institute of Technology (ETH), Zürich was awarded the 2002 Nobel prize in Chemistry ”for his development of nuclear magnetic resonance (NMR) spectroscopy for determining the three-dimensional structure of biological macromolecules in solution”. He showed how to extend NMR to image biological molecules e.g. proteilns. Kurt Wüthrich was born in Aarberg, Switzerland and received his education at the University of Bern, followed by research leading to a Ph.D. from the University of Basel in 1964. The significance of this research is that technologies based on Nuclear Magnetic Resonance spectroscopy can for example that “the knowledge of the three-dimensional structure of a protein can allow much more accurate determination of its interactions with a candidate drug molecule or with other proteins in a cell to be made.” (The Scientist). “One example of NMR-determined protein structures comes from studies of the prion proteins involved in the development of a number of dangerous diseases such as mad cow disease (Nobel Prize in Medicine to Stanley Prusiner in 1997). 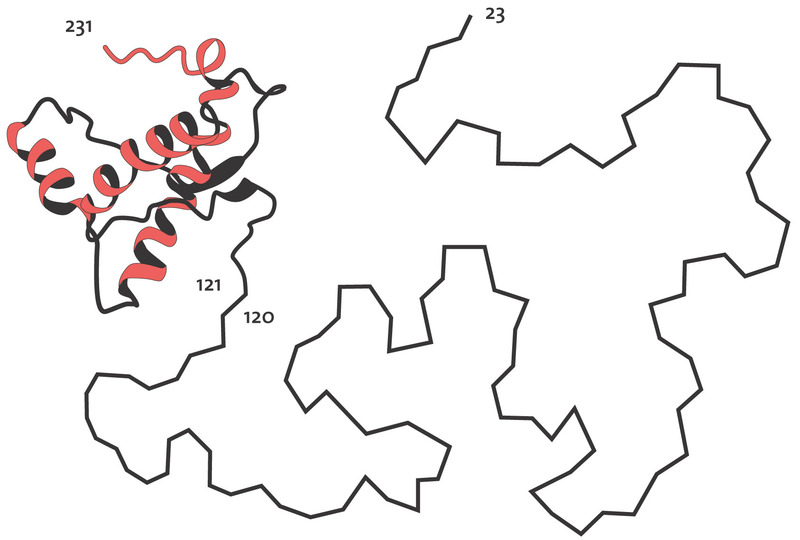 Here Wüthrich and coworkers have shown with NMR methodology that the healthy form of prion proteins has two parts: approximately half of the protein chain assumes a well-ordered, fairly rigid three-dimensional structure in a water solution (121-231 in the picture below), while the other half is without structure and very mobile (23-120). Structure of prion protein, determined with NMR. Half of the protein chain (23-120) is disordered and quite flexible in water solution. Image is courtesy of the Nobel Prize website.